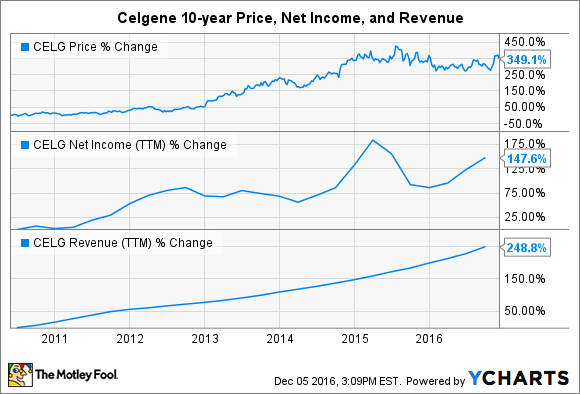 Is Celgene a Buffett Stock? How does the biotech giant stack up against Buffett's acquisition criteria? As of the end of September, Berkshire Hathaway (NYSE:BRK-A) (NYSE:BRK-B) held more than $68 billion in cash on its balance sheet. Remarkably, this figure is actually up since the start of the year, even though Berkshire recently acquired Precision Castparts for $37.2 billion. That invites the question: What other companies could Buffett have his eye on right now? While there is no telling what other companies the Oracle of Omaha could be eyeing at the moment, we can use the acquisition criteria that he lays out in his annual letter to shareholders to determine whether a stock might interest him. While we can't eavesdrop on Buffett to learn what kind of offering price he might receive for swallowing a company whole, we can use his first five criteria to determine whether a stock would pique his interest. With that in mind, let's run the biotech giant Celgene (NASDAQ:CELG) through this criteria to see how it stacks up. With tens of billions of dollars to invest, Buffet can no longer waste time looking at small deals. Thus his first requirement is designed to slim down his list of potential candidates to only those that are worth his time. Celgene passes this test with ease. Thanks to a slew of hit drugs like Revlimid, Pomalyst/Imnovid, and Otezla, Celgene rang up more than $9 billion in annual sales last year. That allowed the company to produce a pre-tax profit of more than $2 billion. CELG Revenue (TTM) data by YCharts. I don't think Buffett would be willing to overlook the profit drop, so Celgene fails this test. Buffett believes the best businesses are capable of generating strong returns on capital without having to hit up the debt markets. CELG Return on Equity (TTM) data by YCharts. While Celgene has produced stellar returns on equity over the last few years, the company's debt load has risen considerably over the same period. 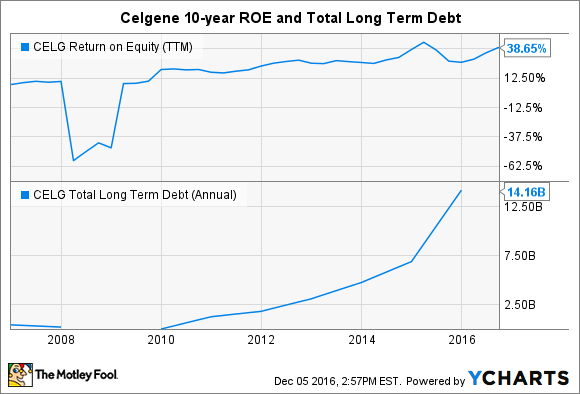 Right now Celgene's total debt load exceeds $14 billion, which is an enormous figure, even for a highly profitable company like Celgene. My hunch is that Buffett wouldn't give Celgene a passing grade here, either. While Celgene's current CEO, Mark Alles, has been in the top chair for only a few months, he certainly seems more than capable of leading the company. Alles has been with Celgene for more than a decade and has held a variety of executive-level positions during his tenure with the company. Prior to joining Celgene in 2004, he also held management positions at other pharma companies like Aventis, Bayer, and Centocor. Celgene's former CEO Robert Hugin remains quite active at the company, too. Hugin joined Celgene in 1999 and served as CEO from 2010 to 2016, during which time the company's revenue, profits, and share price all soared. Hugin currently serves as executive chairman, so Celgene appears to be in great hands with these two leaders calling the shots. Buffett doesn't like to stray from his "circle of competence," which is why he primarily buys businesses that have simple business models -- think newspapers, insurers, and candy makers. For that reason, I have a hard time believing that he would consider buying a biotechnology stock -- even a highly profitable one like Celgene. Image Source: Tax Credits on Flickr. Beyond the mind-bending science, Buffett probably wouldn't like the business model that big drugmakers depend on to remain relevant over the years. After all, drugs lose patent protection after a while, forcing the companies to invest billions in research and development each year. Sometimes that research pays off big, and other times product candidates can fail in spectacular fashion. Thankfully, Celgene boasts a track record of success at developing new medicines, and it has a pipeline that is packed with potential. Celgene has many clinical studies underway that would expand the labeling for hit drugs like Otezla, Revlimid, and Pomalyst/Imnovid. In addition, the company is interested in expanding into new disease states. Last year it ponied up $7.2 billion to acquire Receptos, which added Ozanimod to its pipeline. This promising drug holds breakthrough potential in treating diseases like ulcerative colitis and relapsing multiple sclerosis. This is all exciting, but I can't help feeling that Buffett would simply toss this company into his "too hard" pile and move on. Is Celgene on Buffett's buy list? Celgene scores only a two out of a possible five on Buffett's checklist, which tells me that this company isn't likely to attract his attention. Of course, just because Celgene scores poorly on this test doesn't mean that it isn't worth owning. Celgene has been a market darling for years, and its management team is on record saying that the company will produce more than $21 billion in net product sales and $13 in earnings per share by 2020. If true, that means investors can expect double-digit growth for the foreseeable future. I for one am a believer in this company's long-term potential, which is why I became a shareholder earlier this year. 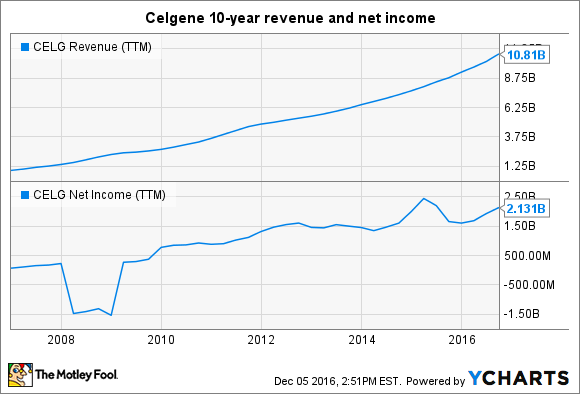 If you're a biotech investor who loves growth, then Celgene might be a good choice for you, too.